Acknowledge your inner critic tends to overestimate risk and underestimate talent, skill, and capability. The value of risk is motivation and preparation. The danger of underestimating yourself is paralysis. Self doubt suggests you want something. You don’t experience nagging self doubt over an opening in management, if you don’t aspire to management. Step toward nagging self doubt, not away. You can’t be certain you have what it takes if the assignment is a stretch and you’ve never done it before. Choose aspiration over anxiety. Life lived avoiding risk ends up more stressful than life lived leaning in. In short bursts, fear elevates energy, enhances creativity, and stiffens resolve. 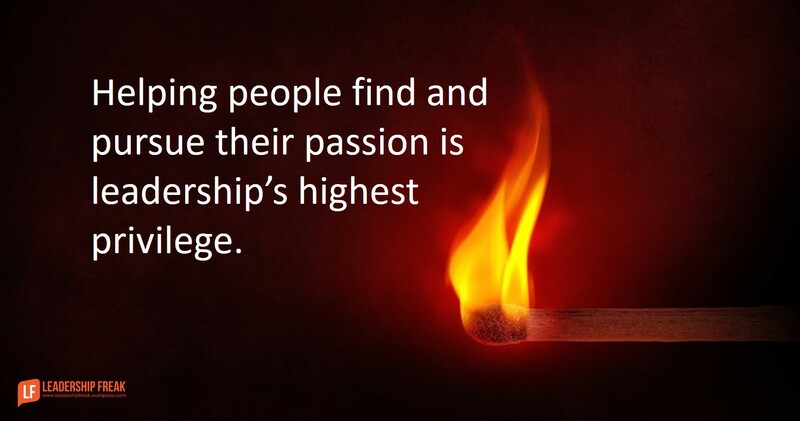 Helping people find and pursue their passion is leadership’s highest privilege. Call for a commitment. “What are you willing to commit to do?” Listen for don’ts. Ask for dos. A commitment is a decision you don’t have to keep making. Vacillating never inspires. Commitments find expression in behaviors. Bonus: What happens if you do nothing? How might leaders help team members face self doubt and find gusto? “You can’t be certain you have what it takes if the assignment is a stretch and you’ve never done it before.” I really like that advice as sometimes you can block yourself before even giving it a try. How do you know you’re going to fail or you’re not good for a task if you have never tried it? You may surprise yourself and excel at something that you never considered trying. Give them the Freedom to make mistakes and even fail without punishing or humiliating them. @ Jim – that’s good advice to persons supporting “the self-doubt team member”. For me (and from my observations) it is mostly impossible to move past this self-doubt without a support network, opportunities and an “agreeable team” (not easy to find all three of these elements together). Take him with you so he can see/hear you do it. Do it again…and again. Give him time…he will be anxious to try his hand. Thank you for your positive take on the role of leaders. Your 5 Steps to Gusto reminds me of an article I read in Educational Leadership by Ronald R. Bearwald called It’s About the Questions. In sum, the article shares how to make coaches effective. To create growth in teachers, coaches must listen and question, not provide quick fixes. Although your article may not be directed at teacher leaders, it is much of the same experience. My favorite of your questions was the bonus, “What happens if you do nothing?” For a teacher, that means a student losing out on an opportunity. Can we risk that? I know you asked how to help team members find gusto, but these 5 steps are already a strong start to supporting them.